Wondering what the next Big Thing might be in terms of DVD/Blu-Ray technology? The secret might lie with the lowly mantis shrimp. Scientists at the University of Bristol have discovered that the creature’s eyes use a technology very similar to what is found in the current generation of CD and DVD players — except Nature’s version is far superior. Specifically, the mantis shrimp boasts “trinocular vision.” Each eye moves independently and can focus on three different aspects of an object. And while human vision is based on detection of three basic colors, the mantis shrimp can detect 12, and can “tune” the levels of light the photosensitive cells in their eyes can detect. What the Bristol scientists found most intriguing is the mantis shrimp’s ability to detect polarized light: not only can it see the kind of polarized light that vibrates in a single plane as it travels — like “attaching a piece of string to a wall and shaking it up and down,” according to science writer Ed Yong — but it can also see polarized light that travels in the shape of a helix. It’s the only known creature in nature who can do so. That’s because if you look at a mantis shrimp’s eyes under a microscope, you’ll see an unusual structure that mimics a common component of camera filters, CD and DVD players, called a wave plate. 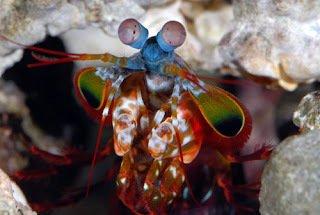 The synthetic version of wave plates only work for a single color of light; the version found in the mantis shrimp’s eyes works for all the colors in the visible spectrum of light, from ultraviolet to infrared. Now if only scientists can figure out how to mimic and reproduce that unique structure — perhaps using liquid crystals — we could have a whole new generation of Blu-Ray and other optical storage devices. ‹ Holy Concussive Incident, Batman!